Is dabbling in video games a valid method for learning a foreign language? Slaying dragons and fighting epic space battles may be an entertaining way to kill some time, but it’s not what most people would associate with learning a new language. Perhaps it’s easy to change the in-game language of your favorite ego shooter or role-playing-game, but what’s the use of knowing the French word for “two-handed sword” or “quantum-cannon” in everyday life? 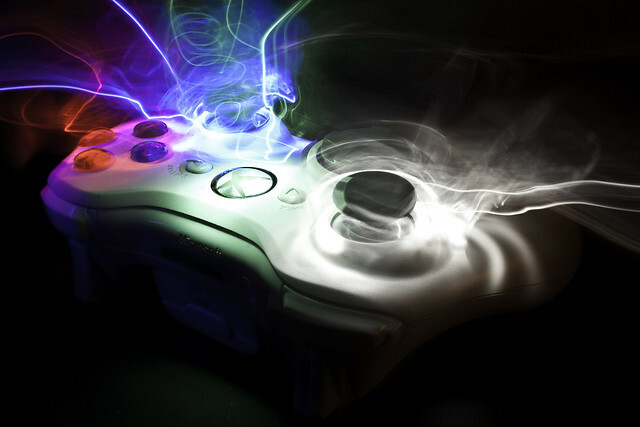 Playing video games in our target language can have many benefits. Above all, it puts us in authentic situations. What’s authentic about slaying orcs? Well, it’s not the content, but the context. An authentic learning situation puts the learner in a position where he has to make choices (just like in real life). The better she understands the story, options or characters in the game, the better her choices become. Dionne Soares Palmer, a freelance writer from California, wrote her PhD dissertation on learning Spanish through playing World of Warcraft. After eight months of playing the game in Spanish — now that’s academic rigor! — she had jumped two levels in a placement test. Despite the negative stereotypes around this particular game, like any other massive massively multiplayer online role-playing game (MMPORG) it demands in-game communication with other players around the world in both written or spoken form. While playing the game in a foreign language you will eventually come across native speakers and be exposed to nuances of natural language a textbook just can’t provide. Not only will you be able to get direct feedback from native speakers (if they’re are so inclined), it also puts you in a situation of urgency. You’ll have to make yourself understood! When you are playing a game which requires fast decision-making — it doesn’t have to be a MMPORG — you can’t just look up a word in the middle of a battle, because you might die. Not sure whether an icon signifies a healing potion or a deadly spell? Well, you either use it or you don’t. And each choice comes with a consequence. It’s this kind of urgency that may put a learner’s attention into high gear to quickly grasp core phrases and circumstances. Learning a language demands a lot of motivation. Games which are task-based and require in-game communication or deep understanding of a storyline might provide you with that impulse to just try “one more time”. Unlike learning from a book, failing is much less painful in a game. According to Guardian columnist Oliver Burkeman and Jesper Juul it may even be that “the continuing possibility of failure is what makes games worth playing”. In a video game, failure doesn’t come at great cost. We just pick ourselves up and try again. Good games are designed in such a way that the more we fail the more we want to succeed. It’s this dynamic which language learners can tap into. Learning a language can be an often frustrating and tiresome ordeal. We’re bound to pick the wrong word, inflect a verb ad absurdum and mispronounce in a myriad different ways. If we can’t avoid failing, why not treat it like a game? While repeating a certain level or task within a game, a player will come across the same unknown words or phrases many times, thereby strengthening the new material. Also, since the player’s response in the game correlates with tangible actions, the “novel word or phrase will be associated with the correct action through conditioning” (UNC), similar to the way infants learn their first language. So, what are you waiting for? Set your favorite game to your target language and see how much you understand. Perhaps, if you’re only at the beginning of your journey, it might be worthwhile to replay a game you’ve already mastered in your native language. If you’re using Steam, you can download additional language packs for free, simply by clicking on a game’s properties in the Steam client and choosing your language. While browsing games in steam, make sure to check if the supported languages (screenshot) come with full audio. Here’s a quick guide and overview of some of Steam games with full German support, for example.